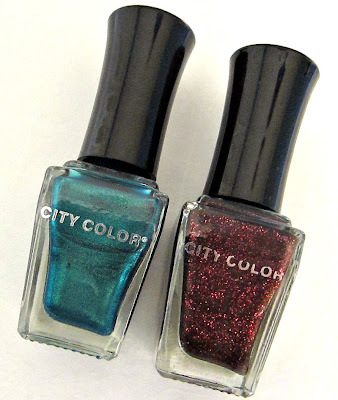 Last month I saw a display at Rite Aid that contained six City Color brand nail polishes. The name on the display was simply "Glo". I believe I picked up some shades from this line last Spring, but they were in larger square bottles. 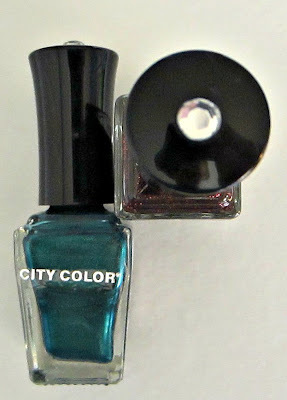 I've done a little Google searching, and I have no idea who manufacturers these, or who City Color is. There's nothing on the label that indicates a company or a location, and the colors themselves are somewhat nameless. The label on the back says Nail Polish, followed by Dark Green and Reddish Purple in parentheses. I'm curious to know if anyone else knows more about this brand. The bottles are small, weighing in at only 0.170 fl. oz., and they're priced at $1.99 each. But you also get a nifty rhinestone in the cap for that price! The City Color name is actually just printed on a peel-off label. The formula seemed nice enough though, and other than a rogue brush hair that I had to cut down to size, I found that they applied nicely using two coats and they dried at a fairly quick speed. Here's a look at the less-than-creatively-named Reddish Purple. 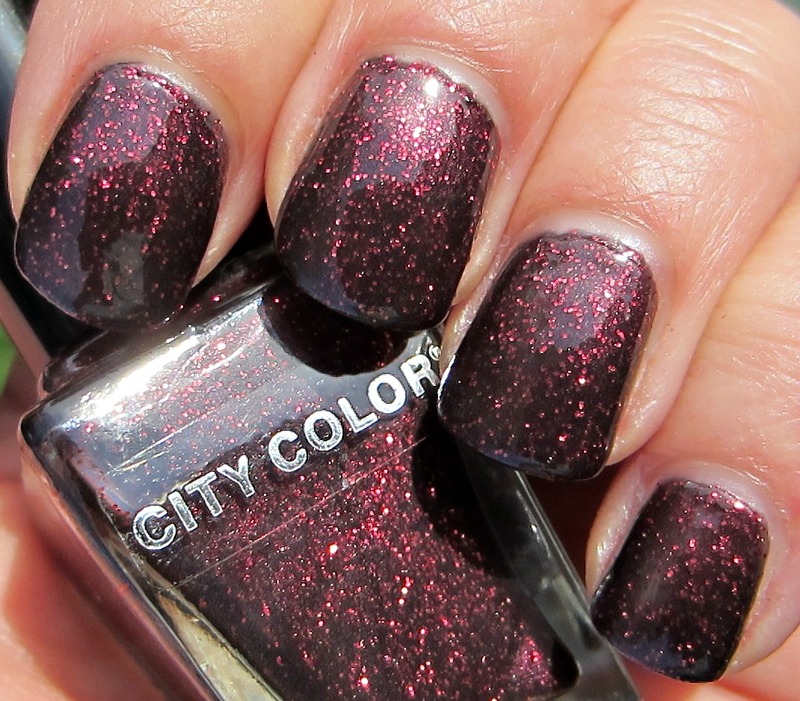 This shade has an off black base and is filled with small reddish/purple glitter...hence the name "Reddish Purple", I guess! The off black gives it a bit of a smoky look--almost like it has a slight film over it. 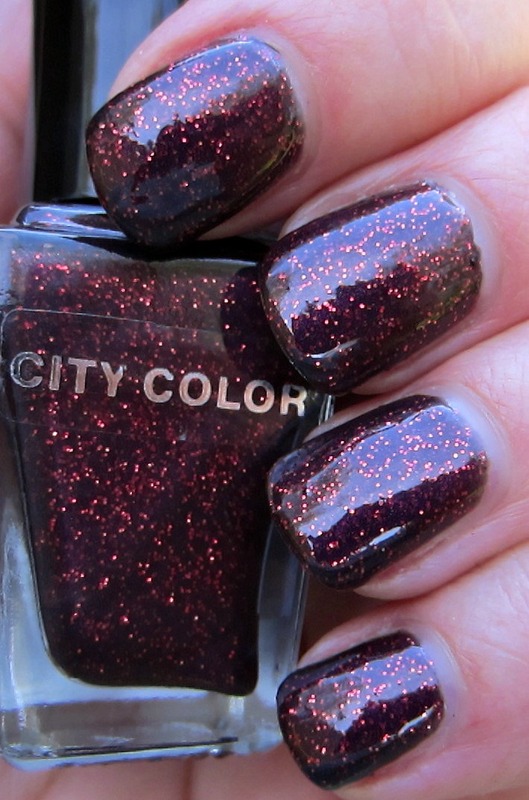 This is a very pretty color, and it definitely deserves a more descriptive name! Dark Green also needs a better name, don't you think? This is a lovely turquoise shimmer that has almost a plush texture look. The shimmer is very fine, but plentiful. It's more of a blue/green while the base is a turquoise, so it seems to have some depth to it in real life that I wasn't able to capture with my camera. My little Greta girl is missing her true love, Gus. All of the dogs normally make a mad dash for the door when I go out to take my pictures, but she's been very sad since we lost Gus last week. Today is the first day I haven't had to coax her to come out with me, so I know she's healing in time, just like the rest of us. Those polishes are really pretty! Greta is a pretty girl, and I'm glad she didn't need to be coaxed outside! Like the Reddish Purple. Pretty shimmer in it. So sorry for poor Greta. Wondering where Gus went. Poor baby. I saw these today at Rite Aid! The bottles were very small, and like in your photos, the labels looked worn or cheap, but the colors were intense. I noticed the same two colors you swatched. 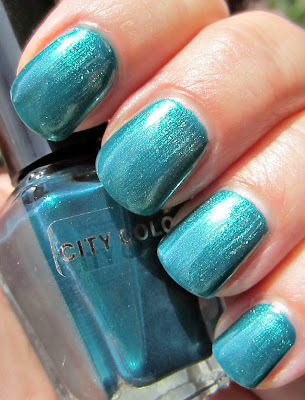 The teal frost looked almost duochrome in the bottle. 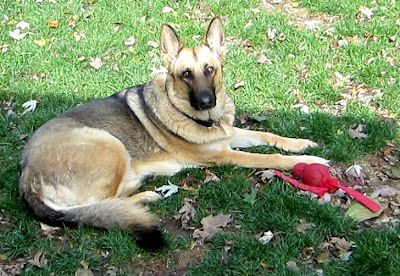 Awww *sweet puppy rubs* to Greta! Poor dear. When our Max passed away I was sure our cat Cassie was going to follow--she refused to eat or drink, just would lie in the spot where his food dish had been. 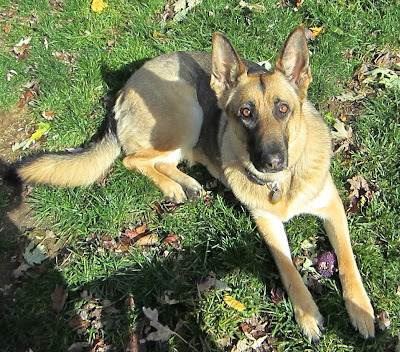 I really think if we hadn't gotten our current dog Willow a week later, she wouldn't have bounced back. 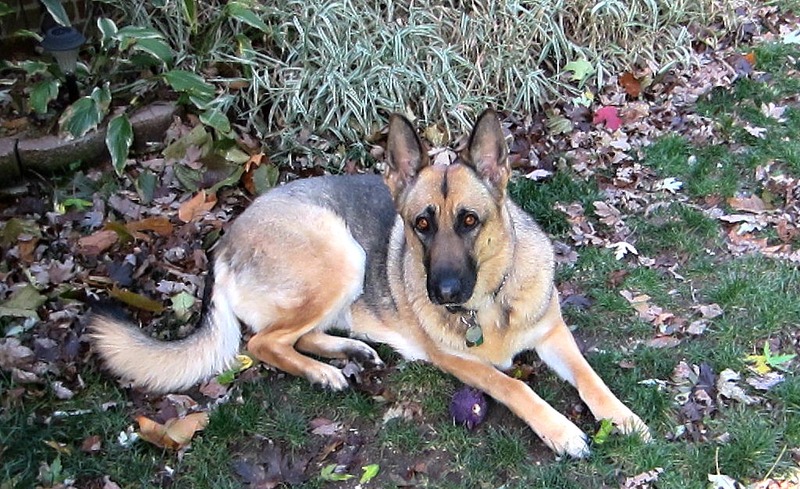 I'm glad to hear that Greta is healing along with the rest of you. It's been 4 yrs and I still cry over Max and my other angel furbabies. More than polish, I just wanted to tell you that I cried when I read about Gus. I'm foolish I know.. my heart goes out to you anyway. Hugs! I've been wondering about these polishes; I've been seeing them for a few weeks. The reddish-purple one is really pretty! Give Greta a big hug for me. I know how hard it is for people when we lose our fur babies, but the fur babies left behind don't know or understand what happened and it must be so hard for them. Hugs to you too for your loss.